Goodreads has a pretty cool feature that allows you to display all the covers of the books you completed that year. 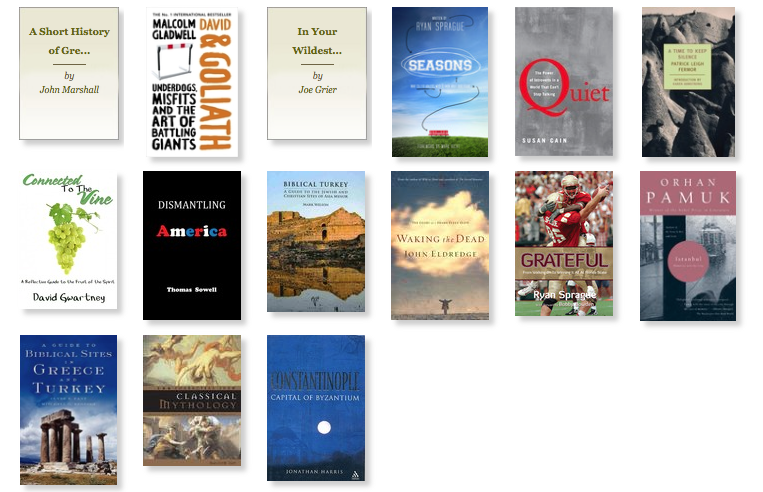 Since I am always reading something – and am always interested in what others are reading – I thought I’d share the books I finished reading in 2013. The end of the year is always a great time to review memories, milestones, and significant moments from the past year. A recent interest of mine – and a reoccurring theme in the events of life – has been Greek Mythology, and the larger role of myth in our lives. I realize that initially, most people will assume that mythology has very little to do with their lives. But I have come to realize that my life needs a good dose of a mythic element to it. I will attempt to explain how I arrived at this realization, and why this has anything to do with a book by John Eldredge. Last year, in anticipation of a trip to Greece and Turkey that took place this past March, I began reading a collection of classic Greek myths. I’m sure you are at least vaguely familiar with characters such as Jason and the Argonauts, Helen of Troy, Hercules, and the adventures of Odysseus. I enjoyed reading the full accounts of these stories and began making connections to the larger meaning of these myths in Greek culture. I also began to understand the role of myth in any given culture. I posted my thoughts on how understanding mythology might give more insight into the Biblical book of Job. This connection isn’t normally made because most today misunderstand myth. For the majority of people, a myth is a fictional story, or even an outright lie – something akin to a fib. If I say that Job is a mythic story, most will assume that I mean to say that the story of Job never really took place. But that is not the true meaning of classical mythology. Myths were ancient attempts to describe what was happening in the spiritual realm, where the gods were at work. And myths today still serve to connect us to deeper truths and help us recognize where God is still working. 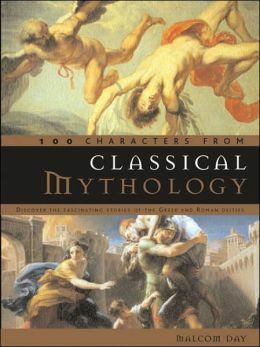 So when I read another book, 100 Characters From Classical Mythology, something was tugging deeper at my soul, but I didn’t know what it was. I intended to write about the book, but I honestly didn’t know what I would say. Nevertheless, I enjoyed reading it. Then one of those moments took place where several seemingly unrelated trails suddenly merged together down a clear path forward. It happened, appropriately enough, while in Athens, Greece. Maybe it was spending the day walking among temples to Zeus, theaters to Dionysus, and statues of Poseidon that served as inspiration – I am certain all of that only fueled the inspiration. 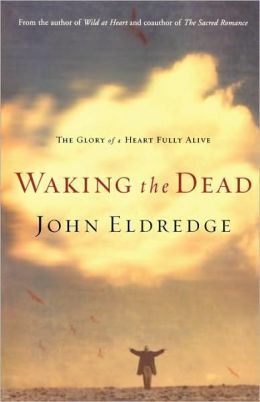 But while on that trip, I began reading a book by John Eldredge called Waking The Dead. You will not think clearly about your life until you think mythically. Until you see with the eyes of your heart. I realized that my heart was getting bogged down in errands to run, bills to pay, and obligations to meet. I was losing touch with the larger story I am a part of. I think that is why reading about the Trojan War and Perseus and Pegasus stirred something in me. Eldredge helped connect that stirring to the passions God has set in my heart. Greek mythology may not do much for you, but the principle is the same. You can view whatever stage of life you are in through the lens of the reality before you – be it sitting in front of a computer screen all day, changing diapers, or paying off school loans. Or you can view your life with the eyes of your heart and see the larger story you are a part of. I have determined that I need more of the mythic element in my life.